Use of tools -- ravens use rocks to crack eggs, kind of like we use a countertop. Emotion -- elephants show empathy by waiting for injured and old herd members on journeys. When was the last time you took a walk with your grandparents? 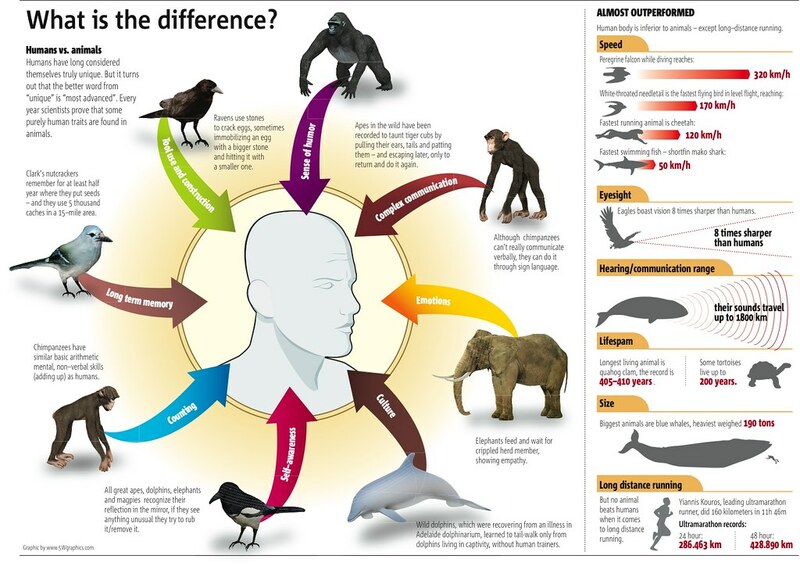 Self Awareness -- great apes, elephants, dolphins and magpies recognize their own reflection and try to rub off blemishes. Have you popped a pimple lately? Long Term Memory -- Clark's Nutcracker birds can remember where they stashed seeds in a 15 mile area for up to six months. This actually beats my own long term memory. Complex Communication -- Chimpanzees can communicate using sign language. What say you, SYSK Nation? Anyone have any good stories about animals seeming, as Rob Zombie once said, more human than human? What happens to chimps used in medical research? Are chimpanzees evolving in the wild? Can chimpanzees learn human language? Do elephants never forget?